Pope Francis has turned out to be a politically active pontiff who has taken a high-profile role in the Israeli-Palestinian conflict, Syria, Venezuela and other parts of the world - except in his native Argentina. Contrary to what many here expected when he was named pope in March 2013, Francis has not become a foe of Argentina's populist President Cristina Fernandez de Kirchner, with whom he had a tense - if not hostile - relationship during his years as Archbishop of Buenos Aires before he moved to the Vatican. When Francis was chosen, the Argentine government reacted coldly to the news, while the rest of the region was openly celebrating the election of the first Latin American pope. At the time, there was speculation that Francis would become a thorn in the side of Argentina's government, much like Polish-born Pope John Paul II was of Poland's Communist government in the 1980s. Instead, Francis has developed what seems to be a very cordial relationship with Fernandez de Kirchner. They have met three times since Francis' election. They have also exchanged several gifts, including a pair of baby socks that Francis gave Fernandez de Kirchner on occasion of the birth of her first grandson. In Argentina, where Francis is one of the most popular figures ever, political analysts who follow his steps with a microscope are quick to remind visitors that the pope is giving Argentina's president much more time than he does to other world leaders. 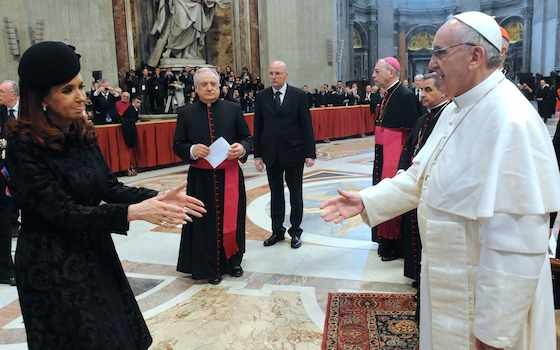 In March, the pope gave Fernandez de Kirchner 2 hours of his time at the Vatican. By comparison, President Barack Obama got a 55-minute audience with the pope on March 27, and the Queen of England got only 20 minutes when she visited the Vatican in April. It is a request to help the Argentine president - whose popularity has plummeted over the last two years - finish her term as scheduled in December 2015. In a country that has had terrible experiences with military coups and forced departures of elected presidents, Francis wants to make sure that democratic rule is not once again interrupted, they say. "I have at least 10 friends who get phone calls from the pope at the most unusual hours, because the pope wants to chat with them, because he misses Argentina," says Carlos Pagni, a prominent political analyst with the daily La Nacion. "To all of them he says, "Cuiden a Cristina." Asked why Francis is embracing Fernandez de Kirchner, well-placed Argentine sources tell me that the two have helped one another in important ways since the day Francis was elected. When Francis was elected, news agencies around the world echoed claims made in a book by Argentine journalist Horacio Verbitsky - who was very close to the Kirchner government - that Francis had failed to denounce human rights violations during Argentina's 1976-1983 military dictatorship. "That was a serious problem for the pope during the first days after his election," a former Argentine official who played a key role in bringing Francis and the Argentine president together said. "Some of us started looking who could help shoot down Verbitsky's claims, and we convinced Alicia Oliveira, a highly respected human rights activist, to go public with a defense of the pope." Oliveira, it turned out, was also one of the pope's closest friends in Argentina. Days later, when Fernandez de Kirchner went to the Vatican, she took Oliveira with her. "Oliveira helped break the ice between the two, and that's how the relationship got started," the former Argentine official said. My opinion: The pope may not make public statements about Argentina, but he is practicing a very active silent diplomacy here. His "Cuiden a Cristina" message to visitors is, among other things, because he believes in democracy, the two have helped each other politically, and they may share views on issues that are key to Francis, such as abortion. But I think there is another reason that may be just as important: the pope needs Argentina to be in peace, because he could hardly gain credibility as a major player in much thornier conflicts in the Middle East and other world hot spots if he couldn't even maintain social harmony in his own country, where he has the biggest political influence. Whatever his reasons, his private diplomacy in Argentina is working. "Pope Francis Carrying Out Silent Diplomacy in Argentina"